Have you noticed my new logo? At first I was thinking of getting a Web 2.0 style logo but then changed my mind - Almost everyone has a so called "Web 2" logo now. So I decided to get something different, simple and nice. In case you are wondering how much time I spent to make it, you might be surprised to learn that I created in less than 5 minutes. 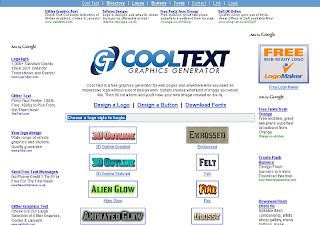 You can create one for yourself as well on the Cool Text: Logo and Graphics Generator site. You don't need any photo editing skills to generate a logo. First of all, choose a logo style by clicking it. Then specify your text, font size, etc. Click the "Render Logo Design" button and you are done.